One thing I love about current Sharp Darts subject Andrew Barber that I didn't mention in my column is that he's the king beef technician. Whenever any rapper with some sort of connection to Chicago gets mad at someone (or vice versa), the news immediately turns up on Fake Shore Drive accompanied by some brief background on the beef, plus relevant quotes and whatever audiovisual form the beef is taking at that point. I actually love Charles Hamilton--especially his Internet-reference-laden track "Windows Media Player," where he actually shouts out URLs--but if Rhymefest's follow-up explanation is true, it was Hamilton who started the beef after he faceplanted in a freestyle session that Fest invited him into. This was a pretty stupid idea. Starting beef with one of the form's leading lyricists usually is. 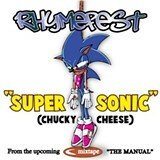 I also like "Supersonic (Chucky Cheese)," except for the huge fact that half of Fest's critique of Hamilton consists of calling him a "fag" for not wearing baggy jeans. It's kind of surprising coming from someone who's supposed to be "not completely ignorant." Last time I checked it was 2009, but maybe I'm wrong and we've actually travelled back in time to an era when it's OK to call people fags in your raps. Which must mean we're somewhere around Nineteen Ninety-Never. 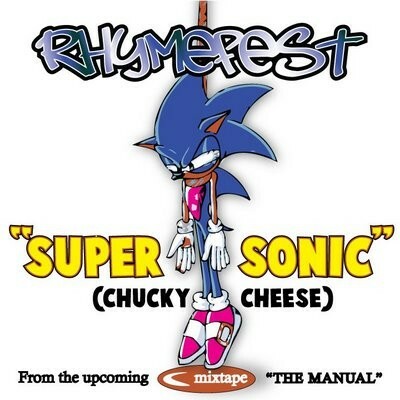 The final score for "Supersonic (Chucky Cheese)" is +1 point for rapping over "Supersonic," +1 for linking JJ Fad to Hamilton and the faddish buzz surrounding him, and -8,000 for homophobia. The judges are still trying to figure out if the drawing of Sonic in a noose is the best or worst thing ever, but they're pretty sure it's one of the two.